You’ve planned your perfect wedding down to the last little detail for the last 2 years and the unthinkable happens… it’s going to rain! There’s some things you can do during your planning stages to help minimise any stress and still have gorgeous images of your day. 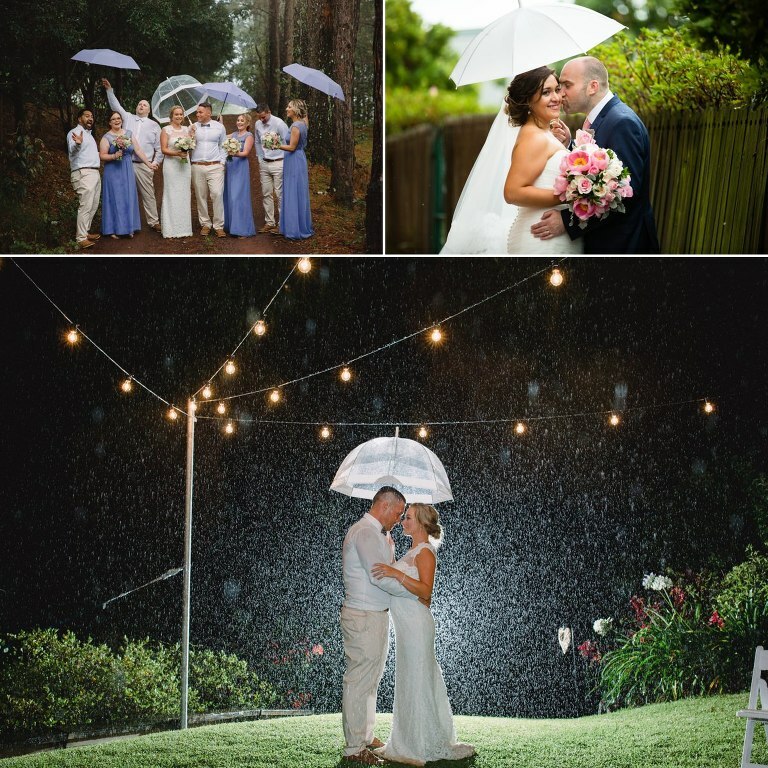 Here’s our top 5 tips for a rainy day wedding! 1 – TAKE ADVANTAGE OF THE RAIN! So many Brides will freak out but we happen to LOVE a rainy day portrait. They are some of our favourite shots ever! As long as it’s a sun shower and not a downpour we say get out and in it.. for even just one shot! It adds a little drama and romance! We know you probably have your heart set on an outdoor ceremony under some clear blue skies or a little garden wedding amongst the trees and greenery. If possible, choose a venue that can cater for both the outdoor dream but also have a back up plan in place. Maybe a gorgeous old barn is available, a little white chapel, or and undercover area that can be transformed. We know and love a lot of venues so we can help you find the right one for you. 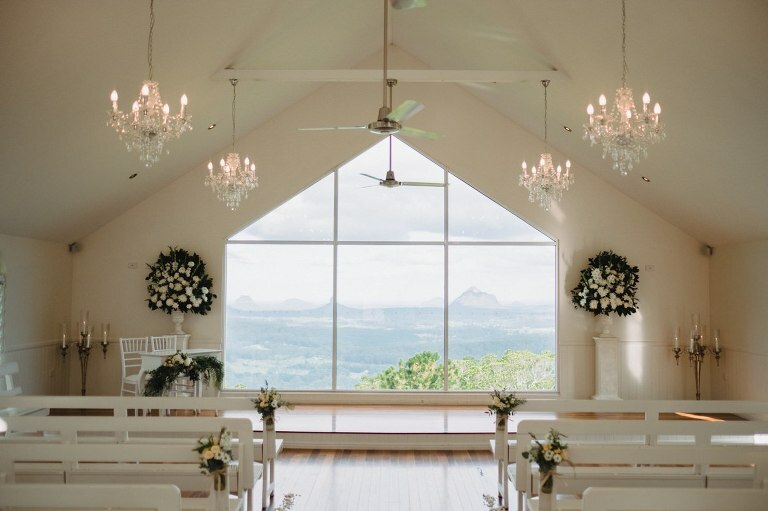 Some favourites of ours are Maleny Manor, Weddings at Tiffany’s and Gabbinbar Homestead. Look for openings that can keep you out of the rain but facing the light. UQ is a great location with it’s beautiful sandstone archways and paths while still letting light through to keep you from the shadows. Doorways, courtyards and even large trees can keep you dry and look great at the same time. Not just any Umbrella.. nice ones! We recommend keeping them either white or clear to that it can let as much light through on your faces as possible. If you have a red umbrella, it will bounce a colour cast of red onto you making your face and outfit red toned, and we don’t want that! Also, Gumboots for the girls are a great idea if it’s going to get muddy! If you don’t have any outdoor options for your portraits, don’t fret. We can go inside and make it work! 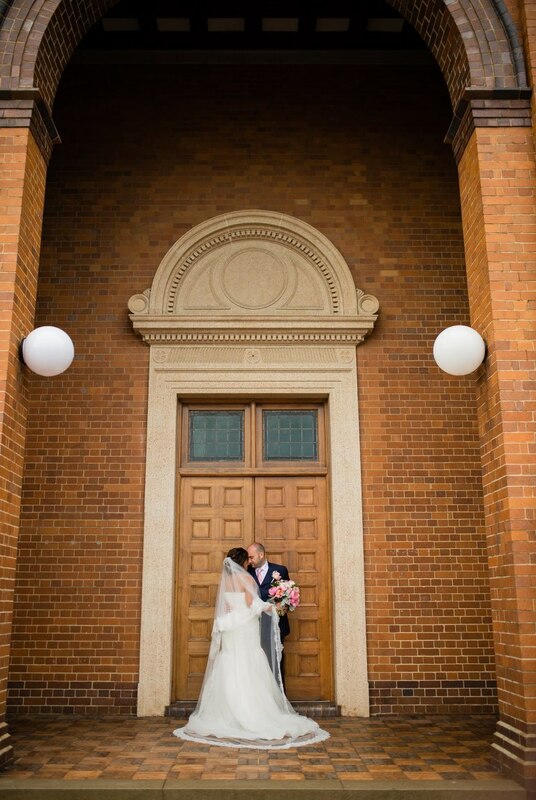 A unique building, dramatic lighting, a gorgeous staircase and many other spots work for both group photos and just the two of you. Remember that if all else fails and you missed out on your dream portrait session due to a wash out we can, and have in the past had a re do! After your honeymoon you can get dressed up again and we’ll go out and re shoot your Bride and Groom portrait session in the perfect weather! That’s exactly what our wet weather guarantee is for!